One of the most important things to consider when selecting an insulator or type of insulation for a transformer is to consider the environmental effects, particularly on air and SF6 gas. That is why we must understand how the gas breakdown is modified when applying different environmental conditions. Here is another article by Carlos an electrical engineer who have already published an article about gas breakdown theory few days ago. First, we must consider the fundamentals of gas breakdown theory of Towsend; you’ll find all the information in the article published on July 12th 2018. As stated in this article, Towsend developed a theory in which the cause of a gas breakdown was due to the flow of electrons in a so-called ionization by avalanche effect once the breakdown voltage of the gas was reached. Now, Towsend was only the first to propose the theory, other scientists followed after and developed important contributions to the gas breakdown fundamentals. This German physicist, developed further experiments based on Towsend’s theory. He realized that when the distance between the electrodes was increased, the breakdown voltage increased. This was reasonable, as the electrons needed a higher electrical field in order to initiate the avalanche process because the distance they had to cover was longer. He also realized that when he increased the pressure in the gas, the breakdown voltage increased as well. The reason for this phenomena was related to the ionization by avalanche process. As described by Towsend, the electrical field (voltage) injected a kinetic energy into the electrons that made them flow from one side to the other. If the pressure in the gas was increased, then it meant that the atoms and particles were closer to each other, in other words, when applying the same voltage, the electrons wouldn’t have enough space as to gain the necessary kinetic energy to cause multiple particle crashes. Therefore, it was necessary to apply a higher initial kinetic energy (higher voltage) in order for the electrons to transmit enough kinetic energy to other electrons and cause the avalanche effect. Raether also experimented using the Towsend’s and Paschen studies. Just that this time, he did it changing temperature and relative humidity as well. The temperature is energy in the form of heat. Therefore, when increasing temperature in the gas, it meant an injection of energy that caused vibrations in the electrons and that pushed them facilitating the creation of the streamer mechanism and the gas breakdown itself. In other words, Raether established that if the temperature of the gas is increased, then the breakdown voltage of the gas is lower. The other environmental condition element was humidity. In this case Raether had to go beyond, when studying the effect of increasing the humidity in the gas, the breakdown voltage increased as well. The reason was related to the size of the water molecule, as it was a lot bigger than the electrons, the water molecule represented an obstacle for the electrons to reach the cathode. However, in order for the electrons to reach the cathode they needed a higher electrical field applied to them in order to provide higher kinetic energy. In other words, in the presence of higher relative humidity levels, the higher is the breakdown voltage of the gas. Gas breakdown: why is this topic important? These are the basic gas breakdown principles used to established the required leakage distances, dimensions and sizes of insulators in transmission lines. They are also related to the insulators in electrical equipments like transformers and circuit breakers. Tables are established by regions to secure the appropriate distances between voltage levels of power lines and metal structures, considering not only distances, but environmental conditions as well. That way you can understand the reasons for electrical failures on insulators located in dry places (low humidity) for example this situation like in picture below (Fig.1). To exemplify the importance of the topics discussed above, let’s examine this case. Many years back when Maracaibo (an occidental city in Venezuela) was being electrified with a higher voltage level (over 50 years back), the transmission line that reached the city was designed according to the standards of the electrical norm in the country, including the insulator distances and sizes. 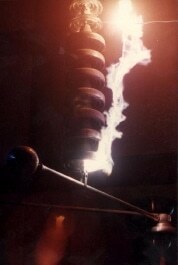 It turned out that, despite the insulator distances were accurately done according to the norm, the environmental conditions of the city (very high temperature over 40°C and low humidity) caused that the voltage breakdown of the air was lower than the typical breakdown voltage of the air for standard conditions, which caused a lot of failures under normal operating conditions of the power system. Your opinion on Carlos’s essay? Share it below! or copy this trackback: http://engineering.electrical-equipment.org/others/gas-breakdown-environmental-conditions-effect.html/trackback from your own site.